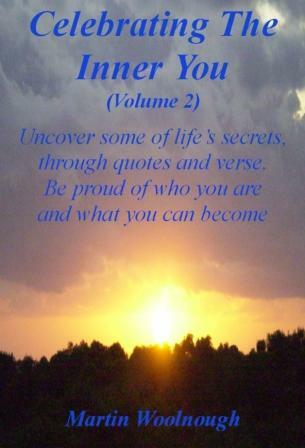 Welcome to the electronic book store page for Celebrating The Inner You: Volume 2 on www.self-esteem-enhances-life.com! This is volume 2 of a series of 3 volumes. It takes the themes of volume 1 and adds further depth and clarity to the material shared. Celebrating The Inner You: Volume 2 is about viewing life as a gift and time as being precious we are motivated to get the most out of each and every day. Let these easily read bite sized pages lead you on a journey with the aim of uncovering more and more of life's secrets - most of which are to be found hidden just beneath the surface, and waiting patiently for you to dig and discover them. The difference between Talent and Genius is, that Talent says things which he has never heard but once, and Genius things which he has never heard. It is the mind which is really alive and sees things, yet it hardly sees anything without preliminary instruction.